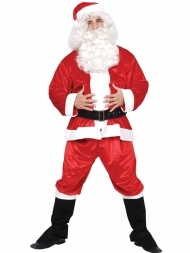 Wonderful Santa costume to buy. Consists of red plush jacket with white trim, matching trousers, santa hat, belt and boot covers. Perfect for your Father Christmas costume. Great large size. Just add a beard and wig to finish the outfit.